This expansive 16,000 square-foot building — completely renovated in 2005 — provides our felines with natural, realistic habitats. It’s a spacious home for some very cool cats. 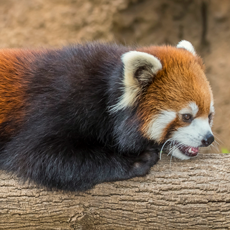 The red panda is not closely related to giant pandas. Red pandas are housed in Big Cat Country because they are geographically from the same wild habitats as some of the “real” big cats. Florence Mila Borchert Big Cat Country exhibit.